Living here in the Northwest we often think about how much it rains, but to truly understand our weather, you have to appreciate our rainshadows. We have world-class rain, but we also have world-class rainshadows. Take a look at the radar image above (from the Camano Island radar). Precipitation (indicated by the colors) all around the place, but there is a rain-free zone downstream of the Olympics...stretching from Sequim to the San Juans. Or take a look at the precipitation over the last six hours from the SPU Rainwatch System (see graphic). You can see that the dry-zone ground zero is just offshore from Sequim. That is why so many people retire there and cacti are native species. As air approaches a barrier it rises, producing precipitation, but on the opposite side there is sinking, drying, and rain shadow creation. You can look at the rainshadow above and immediately know the wind direction near the Olympics--from the south-southwest. To prove this, here is the latest radiosonde sounding at Forks, on the Olympic Peninsula. The general crest level of the Olympics is roughly 5000 ft--approximately 850 mb, with higher terrain above that to roughly 8000 ft. So look at 850-800 on the sounding chart. If you can read the wind barbs, you will see the southerly flow. An important thing to know about rainshadows is that they can move since their position is controlled by large scale wind direction interaction with terrain barriers. So Sequim being dry is not religion. It is just the wind here in the winter is typically from the south to southwest. If the large scale wind shifts direction, so will the rainshadow. 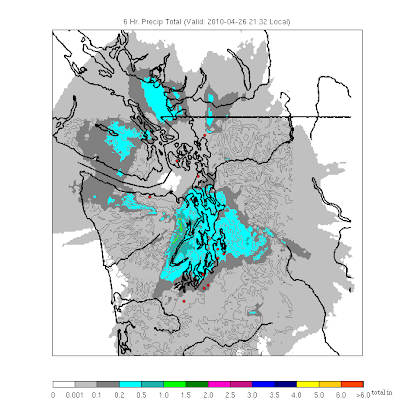 So if the wind switches to westerly or northwesterly, Sequim is no longer effectively shadowed, but Seattle and central Puget Sound is! That will give the retirees and golfers in Sequim something to think about! Such Puget Sound rainshadowing is really quite frequent and helps explain why Seattle is really quite dry (only 37 inches a year), receiving far less than the east coast of the U.S., and WAY less than the Washington Coast. That is why vampires live in Forks but keep away from the Puget Sound lowlands. But there is one ironic complication to our rainshadow under westerly flow....something that literally rains on our parade: the Puget Sound convergence zone, which produces a band of rain IN THE MIDDLE OF A PROFOUND RAINSHADOW. That is why north and south of a convergence zone it can be profoundly clear. Finally, not only can rainshadows move, but we have lots of them due to our complex mountains. Big rainshadows in the lee of the mountains of Vancouver Island, the Cascades, the Blue Mountains. Smaller ones in the lee of Mt. Rainier and the other volcanoes. Even rainshadows int the lee of Queen Anne Hill and Tiger Mountains. Yes, this is really rainshadow land here.